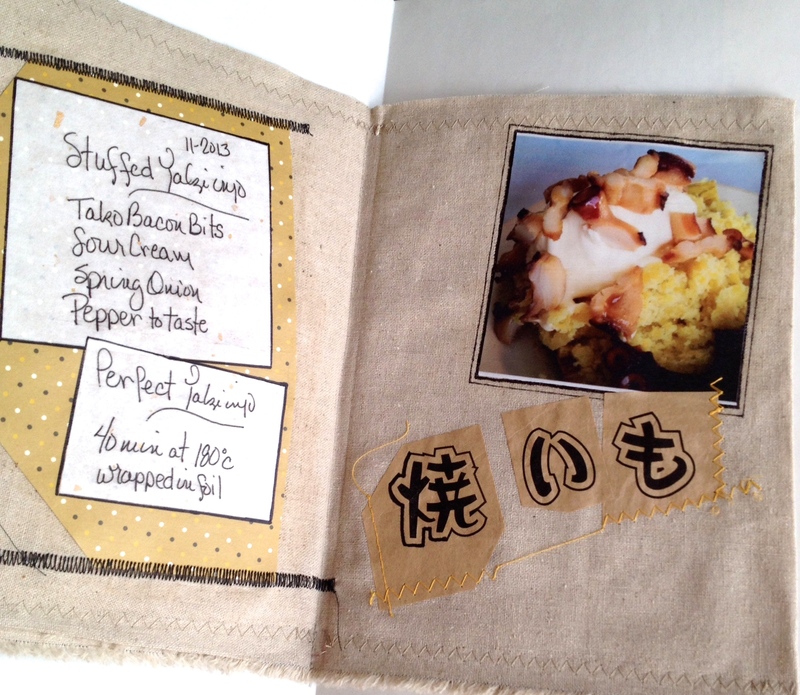 This is a post of fun with mediums, stitch work and mistakes. Lots of mistakes! 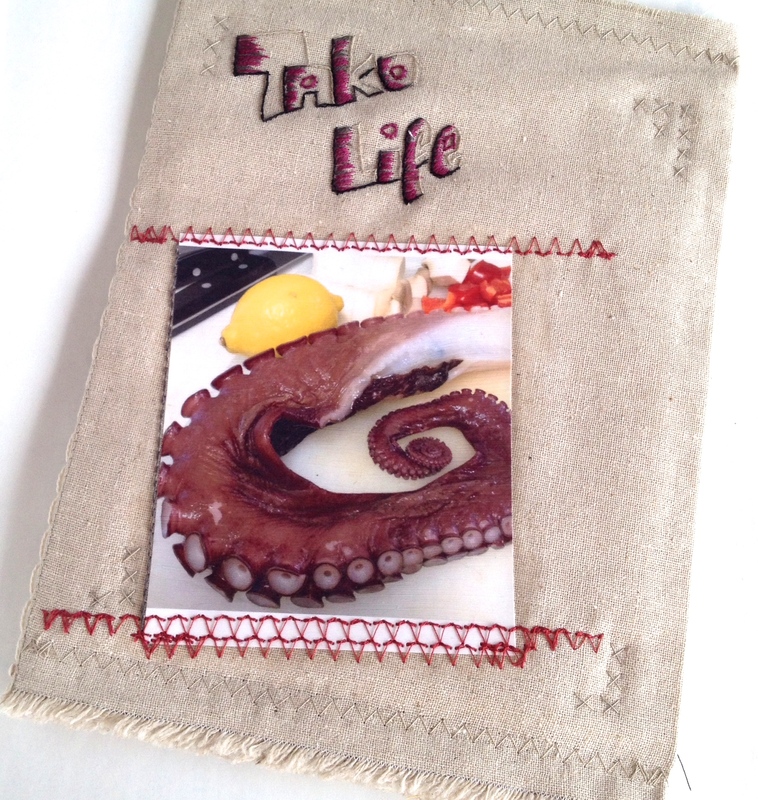 Using the theme of a creative octopus filled life, Tako Life, in which tako, 蛸, is octopus in Japanese. I picked up a meter of a lovely linen/cotton blend fabric and set about determining a good size and shape for my book. 25cm high and using the full 100cm length I thought I was being smart and could create four books from each 1 meter piece. As you’ll see in the following layouts that 25cm is just too high, it leaves way too much open space for the elements I want to include. I pushed on to see what more I could learn. 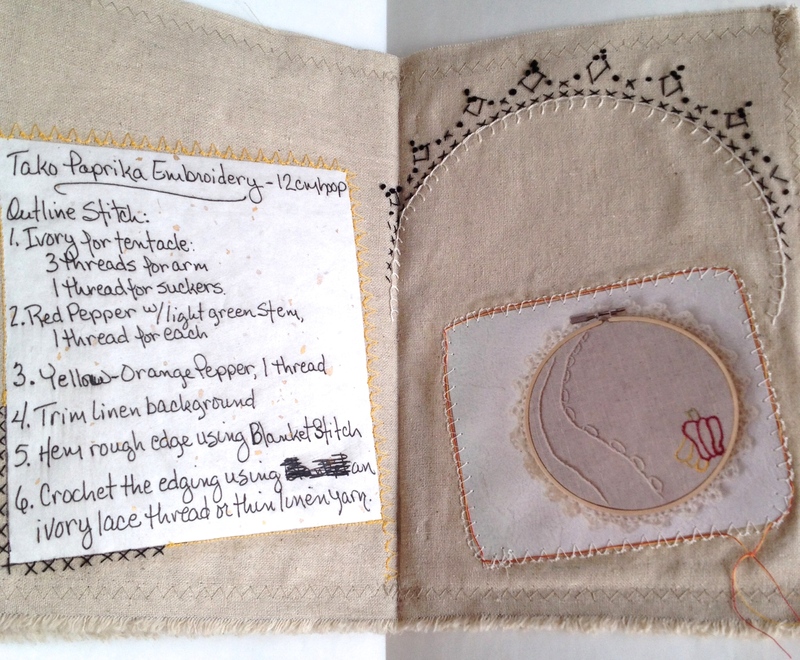 The title is hand embroidered on the cover page, there is a thin layer of quilt batting added to the front cover along with a piece of cardboard for durability but not enough of either. That mistake will be corrected in my next Tako Life Art Book. It may be another mistake but I would really like to overstuff that cover! After printing the photos I wanted to use, I immediately placed them in my new book using Liquitex Matte Medium not using any forethought as to how they should be framed within each layout. Oops. Being a bit sloppy with the medium I now have hard, crusty “frames” around each photo. They are clear so it doesn’t seem too bad but really is not a look or texture I’m going for. This did give me a great opportunity to test those fancy stitches my simple Singer Sewing machine offers and I’ve tested most every one of them at varying stitch lengths and widths. I feel most of them worked in the way I’ve tested in my Tako Life Art Book except for the thick black zigzag stitch. It seems like an overused texture and not very creative. I improved on the machine stitching in some areas by adding hand threaded colors into the embroidery project photo frame, and used a sharpie-type marker instead of thread to frame the Stuffed Yakiimo photo. For looks I added the chain stitch onto the spine, it would interrupt the layout of the inside pages if I pushed it though all the pages. Using hand embroidery work to provide the charted crochet edging pattern is a look I’d like to continue in the next Tako Life art books. In the meantime, while I wait for more printer ink to arrive, I’ll still be playing with more mediums using paper and fabric and whatever else that’s fun from my studio stash!